UC Davis plant geneticist Jorge Dubcovsky examines one of the wheat plants being raised in an indoor growth chamber. Increasing wheat yield rapidly enough to meet population growth has been a challenge for wheat breeders. 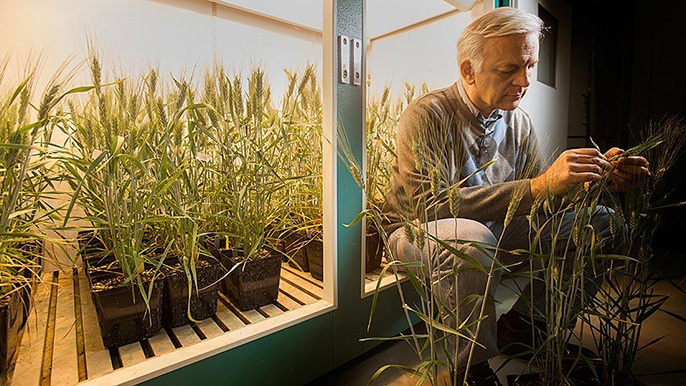 An international research project, headed by plant geneticist Jorge Dubcovsky, professor in the Department of Plant Sciences at UC Davis, is using new technology to identify the wheat genes that impact yield. In contrast to crops like maize and soybean, 65 percent of the wheat varieties in the U.S. come from the public sector (in contrast to private-sector plant-breeding companies). The wheat industry in the U.S. therefore relies on public-sector wheat breeders to develop improved wheat varieties. Wheat is different from other cereals, in that it has a higher protein content than rice or maize, so it’s important for humans. More than 700 million tons of wheat is produced worldwide each year, and 20 percent of the global caloric and protein intake comes from wheat. Public-sector wheat breeders in the U.S. have worked together for many years with the support of USDA Coordinated Agricultural Projects, or CAP, to characterize agronomically important traits such as disease resistance and quality, but significantly increasing wheat yield has been an elusive goal. This year the WheatCAP project is joining forces with the International Wheat Yield Partnership, or IWYP, a consortium coordinating efforts across the world to accelerate improvements in wheat yield. A new five-year $9.7 million grant, from the U.S. Department of Agriculture’s National Institute of Food and Agriculture, will continue to support the coordination of public wheat-breeding programs in the U.S. The research focus is on the identification of genes controlling grain yield and their utilization to improve wheat productivity through breeding research at UC Davis and partnering universities. The wheat-breeding program at UC Davis has long used traditional breeding combined with molecular markers to accelerate the deployment of other traits, but no molecular markers were available for yield. The new molecular markers for genes controlling yield traits will accelerate progress in this area. A wheat yield increase of about 1 percent per year, typical up until now, will not meet the needs of a fast-growing human population. It sounds straightforward, but it’s extremely difficult to breed for yield components. Yield in wheat consists of the average weight of the grain, the number of grains produced per plant, and the number of spikes produced per unit of growing area — these all contribute to total grain yield. In collaboration with a group in the U.K., Dubcovsky’s group previously developed a tool called “exome-capture” (or gene capture) that can be used to sequence most of the wheat genes at a low cost, while ignoring the repetitive part of the very large wheat genome. “Using this new technology, we’ve had to sequence only 180 megabases, rather than the entire 16,000 megabases of the complete bread-wheat genome,” Dubcovsky said. The researchers used this tool to identify more than 10 million mutations in all the wheat genes. Dubcovsky’s lab is working to increase the number of grains in the wheat spike, while other groups in the WheatCAP team and IWYP are focusing on increasing grain size. Researchers are already testing a gene that increases grain size by 7 percent in wheat varieties grown in California and the UK. It is not yet clear, however, whether the increased grain size will result in an increase in total yield. As part of this project, breeders will move the large-grain trait into varieties known to have the potential for producing high biomass and high yield. At least 15 graduate students will be trained in this project at different universities. Each student will be in charge of the identification and deployment of one of the beneficial genes. This training is important because there is an increasing demand for modern plant breeders, and limited places to train them.